If you have never experienced the remote areas of the Tortugas Bank you are in for a treat! Our waters offer superb spearfishing and pleasure diving conditions. Average visibility is 50 to 70 feet and average depth is 60 feet. Our drift diving process allows you to fully experience the areas we visit without the effort of swimming back to a platform and further enhances your under water adventures; and adds to your relaxation. We offer the ultimate in service so that you can enjoy the vast natural environment and your family and friends! You will have the pleasure of watching dolphins frolic in the waves and seeing gigantic grouper in the evenings we anchor off of Fort Jefferson. Viewing the stars at night in the Tortugas is spectacular and relaxing after a full day of diving, fishing, great food and fresh air! We are known for our spearfishing charters and continue to satisfy our "hunters". Our Clients return year after year, booking in advance for the exceptional experience we provide. In addition to spearfishing you may also enjoy hunting lobsters. Florida Spiny Lobster are abundant in the Marquesas and we know where they are! In our opinion they are tastier than any crustacean anywhere, sorry you folks from Maine! 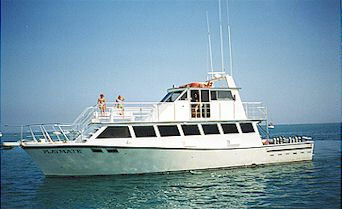 Our 60-foot M/V "Playmate" offers very comfortable accomodations at sea. She is equipped with 4 private cabins,2 heads with showers, air conditioning and fresh water and ice. Not only do we have 2 air compressors, we also offer DANxNitrox with up to a 40% mix. We offer up to 6 dives a day (3 dives on the last day) and will customize all trips to meet your needs and experience levels. For those looking for a unique nature tour experience we also offer 3 day excursions for our Bird lovers during the months of April and May. For families we also offer "bed and boat" vacations customizable to your desires. For our fishers we offer the ultimate in luxury on an overnight fishing tour! We are not like the daily excursions so you are in for a real vacation with your fellow fishing friends! You may bring your boat and "Mothership" or travel in our comfortable accomodations. Please visit the Calendar and Booking and the Destinations and Activities tabs for more information about your desired activities.